French onion soup. Photo by Donna Turner Ruhlman. Without question, French onion is my favorite all-around soup. It’s a satisfying, nourishing meal. Not only does it have all the components of a meal—a nutritious broth, a vegetable, cheese, bread, and a big glass of a big red wine—it’s also got all the textural components that satisfy: it’s soft, voluptuous, gooey, chewy, and, if the cheese is properly browned, crispy. It’s an easy and economical soup. And best of all, it requires no stock, either homemade or store-bought. Yes, the best onion soup is made with water alone, seasoned at the end with wine and, if you wish, a few drops of vinegar. And we’re using this great soup to announce a month-long special offer on our offset soup spoons and offset serving spoon (I especially love how their being offset prevents spoons from slipping off the edge of a bowl or serving dish and into the food). I can’t stress this enough: Water alone make for the best, cleanest onion soup. This is at heart a peasant dish, after all: water, the humble onion, day-old bread, cheese. No fancy stocks required. Just onion cooked way, way down and water to pull out and distribute the complex flavors you’ve developed in the onions. The key is to take good care browning the onion. Don’t try to rush them. Just start them in a big heavy pot or Dutch oven—I salt and cover them so that they begin to drop their abundant water more quickly—and let them cook away, stirring occasionally, whenever you pass the stove or the aroma of their cooking draws you to them. And here’s a great tip: once onions have been cooked down, their cell structure broken down, they can be frozen for a quick weekday meal whenever you need that. That’s why I always urge people to make a double batch when taking the time to brown lots of onion. Can’t be bothered with reading the whole recipe through? Sit back and watch me make onion soup with Martha Stewart (who very kindly gives my other beloved spoons a plug). 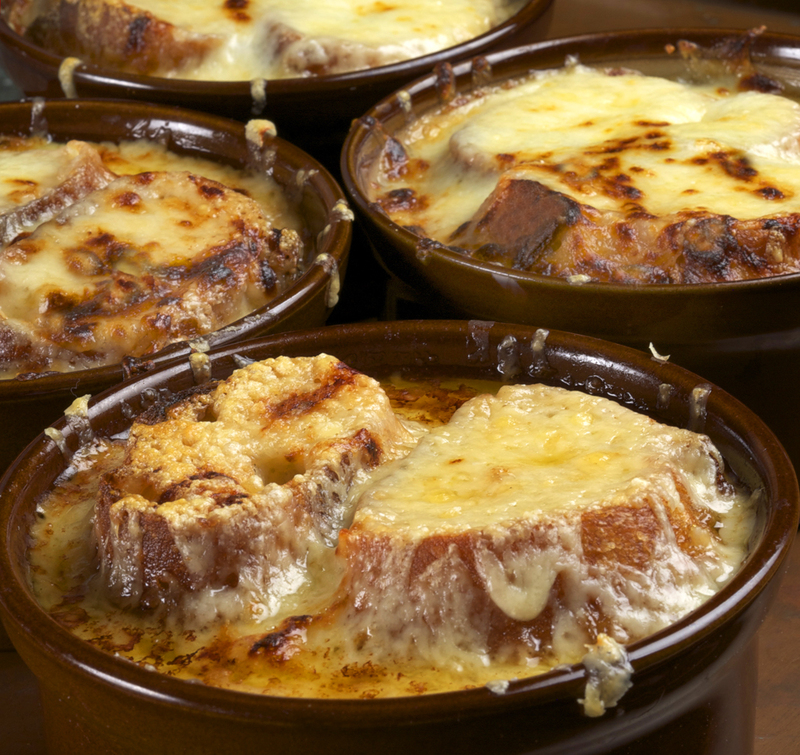 Cool weather is on its way and with it, onion soup. Use a large pot, with a capacity of about 7 1/2 quarts/7.1 liters, that will hold all the onions. An enameled cast-iron pot will provide the best surface. Place the pot over medium heat and melt the butter. Add the onions, sprinkle with 2 teaspoons salt, cover, and cook until the onions have heated through and started to steam. Uncover, reduce the heat to low, and cook, stirring occasionally (you should be able to leave the onions alone for an hour at a stretch once they’ve released their water). Season with several grinds of pepper. Preheat the oven to 200°F/95°C. Place the bread slices in the oven and let them dry completely (you can leave the slices in the oven indefinitely, as the heat is not high enough to burn them). When the onions have completely cooked down, the water has cooked off, and the onions have turned amber—this will take several hours—add 6 cups/1.4 liters of water. Raise the heat to high and bring the soup to a simmer, then reduce the heat to low. Add the sherry. Taste and season with salt and pepper as needed. If the soup is too sweet, add some vinegar. If you would like a little more depth, add a splash of red wine. I like the onion-to-liquid ratio with 6 cups of water. But if you’d prefer a slightly more delicate soup, add an additional 1 cup/240 milliliters water or to taste. Preheat the broiler (be sure you’ve removed the bread from the oven!). Portion the soup into bowls, float the bread on top, cover with the cheese, and broil until the cheese is melted and nicely browned. Serve immediately. My recent posts include the announcement of my new book of novellas, New Cookbook Ideas, and Duck Confit for One. Try making the French Onion Tart from the Smitten Kitchen. Here is a list of various types of onions you can use when you cook. Looking for more soup ideas? Visit Food52 for inspiration. © 2015 Michael Ruhlman. Photo © 2015 Donna Turner-Ruhlman. All rights reserved. Brilliant idea Bunny! I rub a piece of garlic around my salad bowls but I wouldn’t have thought to do that to a pan. I have to stop reading your site before lunch time, Michael! Donna is killing me with her photos!! One tablespoon of butter for that quantity of onions? Seems a little light (or lite, if one is speaking in dietary terms), but it might not matter once they start giving off their water. The water-only aspect is rather fascinating to me; I’ve always done it with homemade chicken stock, not just water, and it’s been fabulous. This is from the Saveur French cookbook, so I regarded it as fairly standard, but apparently it’s not set in stone. Will definitely try a water-only approach next time! I appreciate the simple preparation and straightforward flavor of this soup… I recall you giving more background at one point a while back on not using stock as the base, as it changes the flavor profile and nature of the soup, and I couldn’t agree more. If people have the patience to give the onions the time and color they need, they’ll develop great depth of flavor. Each ingredient is discernible, yet they all compliment each other to make a great homogeneous bowl. To do nothing but entertain myself and explore techniques, I have made this recipe and lightly smoked the onions whole in cherry wood first. The sweetness and subtle whisp from the smoke mentally takes it toward Julia Child’s soup that is finished with Cognac, while giving it added depth without overpowering it with beef flavor. Michael, I tried this recipe from your Ruhlman’s 20 book, using only water. Maybe I used the wrong kind of onions (regular yellow), but the taste of the soup was bitter. I couldn’t doctor it up with sugar or sherry to get it to palatability…very disappointing. Do you thing the type of onions was the problem? What else could have gone wrong? I used regular yellow once also and it came out..bitter-ish. I used Vidalia onions the next time and it tasted as you would expect. Also I did botch a botch once by having the heat too high and there was a bitter/burnt taste also. Did anyone else make this and did your “soup” come out more like onion marmalade? I had to add 12 cups of water to get anything close to approaching soup and then the flavor was all off. So, I simmered it for a while longer to get the flavors to meld again and it was OK.
And before you ask, I weighed the onions (I’m a baker) and got them completely amber before adding in the first 6 cups of water. Yes! Yes, Tim! I made it e-x-a-c-t-l-y per recipe and months later my son made it the same way and we both got that overly sweet, jammy result. You were at least able to recover it; I couldn’t. Apparently we didn’t cook the onions long enough. Looking below (and at the original post from 2011) people cooked their onions for 4-9 hours. This changes the soup from an economical, simple, dish to something very expensive. Who has 9 hours to make onion soup??? Especially since you can’t just leave it on the stove overnight without risk of burning your onions to a crisp. Not sure what the solution here is but like I said, something about this recipe is off. I’ve made your version of onion soup several times – it is now the standard by which I judge all other onion soups – simply the best! I can also vouch for your offset spoons – they have heft and work beautifully. Thanks. This is a brilliant soup! I love French onion soup, but could not see doing all the stock-making that is usually called for. While it took us a while to clean and slice 8 pounds of onions, and roughly 9 hours to get them all golden, the flavor was amazing! Not being one to try to deal with full soupbowls in the oven, I made the toast and melted the cheese on it, and added it at the table. Worked fine, and less chance of having the lovely soup end up all over the floor! Wish the shipping wasn’t so expensive on the spoons. I’d love to have them. I made this once and it was fantastic !! The only problem I had was that I did it during the winter – when the house was closed and I could not air it sufficently because it was 10 degrees out. It took quite some time for the air to clear. Had to wash all of the clothes on my first floor (where the kitchen is) as they smelled like cooked onions – normally not an issue unless going to work or a meeting or such. Like I said – great soup. Just need to do it when I can open some windows.